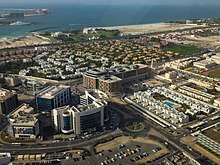 Dubai Media City (DMC), part of Dubai Holding, is a tax-free zone within Dubai, United Arab Emirates. The Dubai Media City was established and built in 2000 by the government of Dubai to boost UAE's media foothold. Since then, it has become a regional hub for media organizations including news agencies, publishing, online media, advertising, production, and broadcast facilities. The groundwork for infrastructure (such as fiber optic cables) was already in place for firms to set up easily and its visa and operational procedures are relaxed for firms operating within DMC. Dubai Media City has become a major hub for the media industry in the GCC and Middle East, with more than 1,300 companies being registered under the Free Zone, from where they serve the entire region. It also houses the International Cricket Council, the governing body for the game of cricket in the world, which was previously situated in London up to 2005. On 14 April 2005, Irish vocal pop band Westlife held a concert for their The No 1's Tour supporting their album ...Allow Us to Be Frank. On 16 November 2007, the Dubai government ordered Tecom (implemented by Du Samacom, by disabling their SDI and ASI streams) to shut down the Pakistani independent and private channels Geo News TV and ARY One World on the demand of the military regime of Pakistan led by General and President Pervez Musharraf. Later policy makers in Dubai permitted these channels to air their entertainment programs, but news, current affairs and political analysis were forbidden to be aired. Later, however, the conditions were removed but a marked difference has been observed in the coverage of Geo TV and ARY OneWorld. On 13 April 2008, du EITC - the second telecommunications operator in the UAE- announced that all of its traffic would be routed via the UAE's censorship proxy which blocks access to any content deemed 'inappropriate'. While Dubai Internet City sells itself as a business-friendly environment with excellent connectivity, the reality is that it is heavily censored. On January 30, 2008 an incident revealed the size of problem, when fibre optic cables between Palermo, Italy, and Alexandria, Egypt were said to have been damaged. There was a significant slowdown of communications. The UAE telecommunications company and DMC’s internet service provider du EITC was one of the worst hit. Since du EITC has a monopoly in the Free Zones, customers had no alternative connectivity during the outage. On 19 December 2008 the three submarine cables between Italy and Egypt were damaged again, disrupting Internet and telephone communications between UAE and Europe, as reported by Bloomberg. There are a total of 84 towers built or planned to be built in the Dubai Media City. ^ Christopher Davidson (30 September 2013). After the Sheikhs: The Coming Collapse of the Gulf Monarchies. Oxford University Press, USA. p. 46. ISBN 978-0-19-936528-9. Retrieved 4 February 2014. ^ "Dubai Media City". Business-Dubai.com. Retrieved 23 November 2015. This page was last edited on 26 April 2019, at 07:29 (UTC).